Congress President Sonia Gandhi addressed a big election meeting in Raebareli as part of her Congress campaign in UP along with her daughter Priyanka Gandhi Vadra. Reminding the people about the earlier alliances in the state, Sonia Gandhi said, “All the parties - BJP, SP or the BSP - have joined hands for power time and again and have together ruined the state. None of these parties are concerned for the development. No one is bothered about the pain and difficulties of the poor. There can be no hope of development in the entire state including Rae Bareli from these parties”. Congress President Sonia Gandhi while addressing an election rally in Raebareli said that her party has always been committed to work for the entire section of the people. “We will continue this principle, come whatever may. But here in Uttar Pradesh it is a matter of regret that all ideals and principles are at risk where a phase of petty interest, corruption and politics of opportunism has been launched in the name of caste and religion,” said Sonia Gandhi. Priyanka Gandhi Vadra is requesting the people to support Congress during her campaign in Meetaganj (Raebareli). While addressing an election meeting in Mateenganj (Raebareli) she requested the people to elect Congress candidates for bringing back development in Uttar Pradesh. Priyanka Gandhi reminded people to think properly about the welfare of the state and its people before casting their votes. Congress President Sonia Gandhi addressed a big election rally in her Parliament constituency Raebareli along with her daughter Priyanka Gandhi Vadra. “We constructed the bridge over Ganga, brought a Railway Factory in Raebareli and also started institutions like NIFT to provide technical education to the youth and to make them self reliant,” said Sonia Gandhi. “There is no shortage of fertilizers at the Centre. But the system of its distribution is not proper in U.P and the farmers are not able to get the adequate fertilizers. Though we had increased the procurement prices to help the farmers, they could not avail of the benefits because of the wrong policies of the state government” said Congress President Sonia Gandhi while talking at an election rally in Raebareli which was also addressed by her daughter Priyanka Gandhi Vadra. “The state Government authorities denied permission to conduct an army recruitment camp in Raebareli. I want to ask you whether the youth in our Amethi and Raebareli have no right for jobs. 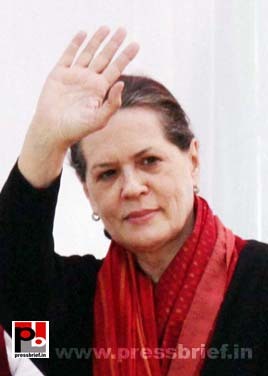 Is there any fault with them?” asked Sonia Gandhi – the Congress President and the M.P from Raebareli. She was ddressing a big election rally in Raebareli along with her daughter Priyanka Gandhi Vadra. Congress President and UPA chairperson Sonia Gandhi addressed a massive election rally in Saharanpur as part of her poll campaign in Uttar Pradesh. She lashed out at the non-Congress parties – BJP, SP and BSP - BSP for not doing anything for development in the state of Uttar Pradesh. “The opposition is very much troubled to see these policies of the Congress. They know very well that they have been doing nothing for the poor other than making hollow promises during elections,” commented Sonia Gandhi. Focusing on the issues of Saharanpur which is internationally famous for its wood carving cottage industry, Sonia Gandhi said, “Apart from various other issues, we also understand the problems being faced by the people here. Our election manifesto has addressed this issue and we will work towards finding a solution. We will work with commitment and devotion to fulfill our promises. I am here to seek your support to accomplish the mission of Congress to change the state of affairs in Uttar Pradesh”. She exuded confidence that the electorate would pay attention to these issues and vote for her party in the coming elections. “I request you to support the Congress and ensure every single vote in the favour of Congress,” said Congress President Sonia Gandhi while concluding her address. “You need a Congress Government in Lucknow too. Please support Congress and elect its candidates. Free your arms and help Congress to form a Government in UP” urged Congress General Secretary Rahul Gandhi while addressing a huge election rally in Hapur. “You have been tolerating the misdeeds of these parties since 22 years. Now stop tolerating and remove these parties and elect Congress. The development will start in five years and in ten years you will not be able to recognize the state,” assured the Congress leader. Congress General Secretary Rahul Gandhi is addressing a well-attended election rally in Jewar as part of his campaign for the ongoing assembly polls in Uttar Pradesh. He asked the crowd, “You have been experiencing the regime of different parties – BJP, BSP and SP - in the state for the past 22 years. Did you get anything?” The crowd responded loudly with ‘no’. He also talked about the atrocities against the poor farmers in Bhatta-Parsaul and Tappal. Congress General Secretary Rahul Gandhi while addressing an election rally in Jewar said that the farmers in UP are not against the development. They are ready to give their lands for development but Mayawati Government forcibly grabbed their land and sold it to the rich builders. Farmers could not get the adequate price for their lands too, said Rahul Gandhi. When the farmers demanded for the proper compensation they got bullets. Congress General Secretary Rahul Gandhi addressed a big election rally in Jewar. When the farmers in Tappal and Bhatta-Parsaul were assaulted by the police, no one from BSP or SP went there. When I went there they questioned my intention said Rahul Gandhi. Congress General Secretary Rahul Gandhi said that in the past 22 years the people in UP got only promises. He was addressing an election rally in Jewar in Uttar Pradesh. Rahul Gandhi also questioned the promise of Mulayam Singh Yadav to convert Bundelkhand to Israel. Congress General Secretary Rahul Gandhi addressed a big election rally in Jewar as part of his election campaign in the poll bound Uttar Pradesh. He questioned the promise of SP chief Mulayam singh Yadav to give free electricity in UP. There is no power plant built in the past 22 years. How can he give electricity then? Rahul Gandhi asked. Congress General Secretary Rahul Gandhi is addressing a big election rally in Jewar as part of his Congress campaign in Uttar Pradesh. He narrated one of his visits to a UP hospital. “There were no doctors, patients or nurses in the hospital. Dogs were scampering inside” said Rahul Gandhi. But it was getting renovated in connection with the visit of Mayawati Ji, he added. Congress General Secretary Rahul Gandhi is addressing a big election rally in Jewar as part of his Congress campaign in Uttar Pradesh. He explained about the pathetic conditions in the hospitals in UP. “Now Mulayam Ji says that he would ensure treatment for the patients in UP at the foreign hospitals. But in fact the people in UP want proper hospital facilities in their state” said Rahul Gandhi. “The people in UP have been witnessing the rule of criminals and a politics of hatred. There are some parties which try to spread the ill-will among different sections,” said Congress President and UPA Chairperson Sonia Gandhi while addressing a big election rally in Moradabad. This city which is known for its famous brass industry is also called "Brass City" or Peetal Nagri. Referring the policies by the Centre for minorities Sonia Gandhi said, “It was Congress which implemented policies for the minorities. Congress implemented the recommendations of the Sachar Committee. For the first time in the history, a separate ministry for the minorities was formed. We also gave loan worth five lakh crores of rupees under the Prime Minister’s fifteen point programme for minorities. Under Sarva Shiksha Abiyan several new schools and Kasturba Gandhi Balika Vidyalayas were opened at various minority dominated areas. We also increased the budget for the Maulana Azad Foundation to provide financial assistance for the modernization of the madrasas. To help our sisters in the minorities we designed an easy-loan scheme for those who want to start their own business. We also granted 4.5 percentage reservation for the backward Muslims. I can name a number of such policies which clearly prove our commitment”. She also explained various Central policies for the welfare of the poor as well as the schemes for the women. Sonia Gandhi said that only Congress can transform Uttar Pradesh. “For the past 22 years the misrule by the non-Congress parties ruined the state of Uttar Pradesh. Development reached a stand still. We should now change this” added the Congress President. Congress President Sonia Gandhi attacked the BSP Government in UP for obstructing the implementation of the Centre's schemes and efforts to develop the state, particularly Raebareli and Amethi. “There was a deliberate attempt to discriminate against Raebareli. They obstructed every proposal by the Central Government for the benefit of this area. I can give you a number of examples to prove this” she said. Sonia Gandhi while addressing an election rally with her daughter Priyanka Gandhi Vadra said that the Centre made a number of schemes for the development of U.P and sent more than one lakh crore to the state under various schemes. “The Centre had sent Rs. 20,000 crore to UP under Mahatma Gandhi NREGA policy which guarantees jobs to the poor, Rs. 9000 crore was sent under NRHM to ensure proper treatment and medicine for the poor, more than Rs. 23000 crores was sent under Sarva Shiksha Abhiyan, and Rs. 8000 crore for Pradhanmantri Gram Sadak Yojana.” “But where all these funds are vanished? she asked and continued, “No doubt, all these funds were swindled out in corruption and scams” said Sonia Gandhi. For the first time in the campaigning for the ongoing UP assembly polls, Congress President Sonia Gandhi and daughter Priyanka Gandhi attended an election meeting together at Raebareli. “There is nothing called law and order. The parties which ruled the state for the past 22 years had no concern for the development of Uttar Pradesh”. Referring to the UPA Government’s policies, the Congress President continued, “The Government at the Centre made policies and schemes for the welfare of the people and also sent huge amount of funds to every state without any discrimination”. Congress President Sonia Gandhi and daughter Priyanka Gandhi attended an election meeting together at Raebareli. Expressing her concern over the situation in UP, Sonia Gandhi said, “Today the people in U.P have been facing a lot of difficulties. Farmers are facing problems because of the non-availability of electricity, water, fertilizer and seeds. The youth in the state are suffering because of the lack of jobs as there are no proper industries. Crime and atrocities against my sisters here have been increasing. The children are not able to get proper education. Congress President Sonia Gandhi and daughter Priyanka Gandhi attended an election meeting together at Raebareli. “I feel sad to see the pathetic state of affairs in Uttar Pradesh. Nobody had imagined this sacred place of legendary Pandit Jawar Lal Nehru, Lal Bahadur Shastri, Indira Gandhi and Rajiv Gandhi will witness such deteriorated conditions like we see now,” she said. For the first time in the campaigning for the ongoing UP assembly polls, Congress President Sonia Gandhi and daughter Priyanka Gandhi attended an election meeting together at Raebareli. “Thank you very much for the warm welcome extended to me. My relation with Raebareli is known to the entire world. I can confidently say that this region has always stood with me and I also have tried my level best to support you from the core of my heart. I have now come to you at a crucial time of elections” she said, starting her address. Congress General Secretary Rahul Gandhi is talking at an election rally in Kanpur. Congress treats everyone equally. It never forms a Government of any particular caste or religion said Rahul Gandhi. He has been campaigning in the entire Uttar Pradesh and leading the Congress campaign in the state for the ongoing UP assembly elections. He urged the people to elect a Congress Government in UP for development. Congress General Secretary Rahul Gandhi is talking at an election rally in Kanpur. I am here not to make promises but fight for the development in UP, said Rahul Gandhi. He has been campaigning in the entire Uttar Pradesh and leading the Congress campaign in the state for the ongoing UP assembly elections. He urged the people to elect a Congress Government in UP for development. Congress General Secretary Rahul Gandhi is talking at an election rally in Kanpur. He has been campaigning in the entire Uttar Pradesh and leading the Congress campaign in the state for the ongoing UP assembly elections. He urged the people to elect a Congress Government in UP for development. Congress General Secretary Rahul Gandhi is addressing an election rally in Kanpur. He has been campaigning in the entire Uttar Pradesh and leading the Congress campaign in the state for the ongoing UP assembly elections. He urged the people to elect a Congress Government in UP for development. Congress General Secretary Rahul Gandhi addresses an election rally in Kanpur. He has been campaigning in the entire Uttar Pradesh and leading the Congress campaign in the state for the ongoing UP assembly elections. He urged the people to support Congress for development. Congress General Secretary Rahul Gandhi addresses an election rally in Kanpur. He has been campaigning in the entire Uttar Pradesh and leading the Congress campaign in the state for the ongoing UP assembly elections. Priyanka Gandhi Vadra addressed an election meeting at Dighiya (Raebareli) as part of her Congress campaign in Raebareli. She urged the people to cast their votes intelligently to change the government in UP. A Congress Government will ensure development reminded Priyanka Gandhi Vadra. Priyanka Gandhi Vadra addressed an election meeting at Dighiya (Raebareli) as part of her Congress campaign in Raebareli. She urged the people to support Congress and elect Congress candidates for bringing back development in the region. This election is to decide your future reminded Priyanka Gandhi Vadra. Priyanka Gandhi Vadra addressed an election meeting at Dighiya (Raebareli) as part of her Congress campaign in Raebareli. She said that all the Congress ruled states are developing as the Governments there make policies after identifying the rights of the people. This election is to decide your future reminded Priyanka Gandhi Vadra. Priyanka Gandhi Vadra addressed an election meeting at Dighiya (Raebareli) as part of her Congress campaign in Raebareli. She explained various works done by Congress President and MP from Raebareli Sonia Gandhi in the region. This election is to decide your future reminded Priyanka Gandhi Vadra. Priyanka Gandhi Vadra addressed an election meeting at Dighiya (Raebareli) as part of her Congress campaign in Raebareli. She urged the people to support Congress so that there will be a faster development in the region. If both MLA and the MP will belong to the same party, then that will benefit the people reminded Priyanka Gandhi Vadra. Congress General Secretary Rahul Gandhi addressed a big election rally in Bulandshahar. He questioned the double speak of Mulayam Singh Yadav on the issue of reservation to Muslims. He also took on Mulayam Singh for forgetting the plight of Muslims. He has been spearheading the Congress campaign in the poll bound Uttar Pradesh. Congress General Secretary Rahul Gandhi addressed a huge election rally in Bulandshahar as part of his Congress campaign in Uttar Pradesh. “I am here to fight for you and my fight is to transform Uttar Pradesh. People with noble intention never make promises” he asserted. “Support Congress and elect our candidates; Bring in a Congress Government in Lucknow. Let us form a Government of the youth.” concluded Rahul Gandhi. Priyanka Gandhi Vadra addressed an election meeting at Dighiya (Raebareli) as part of her Congress campaign in Raebareli. She urged the people to support Congress for bringing back development in the region. This election is to decide your future reminded Priyanka Gandhi Vadra. Expressing her concern over the situation in UP, Congress President Sonia Gandhi said, “The Central Government had sent more than one lakh crore rupees for the state of Uttar Pradesh but what happened to those funds?” All these funds were looted by the Government said Sonia Gandhi. The amount sent under various schemes like MNREGA did not reach people she said. “Do not be misled by the campaign of other political parties and support Congress candidates in Raebareli and in the entire Uttar Pradesh by ensuring every single vote for the Congress,” said Congress President and UPA Chairperson Sonia Gandhi while addressing an election meeting in Raebareli. She was accompanied by her daughter Priyanka Gandhi Vadra also. “Congress has a long history of development and service. Congress is the party of all classes, caste, creed and community. It is the hope of the people” said Congress President and UPA Chairperson Sonia Gandhi while addressing an election rally in Raebareli. She also urged people to support Congress in the assembly elections in the state of Uttar Pradesh. “What we require for the happiness of the people and the development of the state is hard work, devotion, commitment and determination,” said Congress President Sonia Gandhi while addressing an election meeting in Raebareli. “The UPA Government at the Centre under the leadership of Prime Minister Manmohan Singh has set an example for this. Only the Congress can provide such good governance” asserted the Congress President.